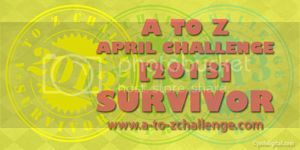 In the last week of March a very good friend of mine Corinne introduced me to this April Blogging Challenge where I was supposed to write on each alphabet all days of the month except four Sundays. I entered into it for 3 reasons- revive my blog, get back to writing daily and make some new friends. What began as a fun trip with so many friends ended up being a challenge as steep as climbing the Mount Everest all alone. Suddenly a much-taken-for-granted comfort zone of my life was torn apart and I was forcefully pushed into my courage zone. Having no other option left I HAD TO DO IT. Never say Die is something I had learnt when I was in school and have always tried to follow it in all aspects of my life. Quitting a job, having issues at the personal front, trying to cope up with loads of travelling and yet managing to write daily – it was surely a challenge for me. But then how can I forget some of the most important lessons I learnt in life at school. Never say DIE. I wasn’t a quitter and quitting was something I detested the most. So I did manage to push myself to write daily though not exactly of the quality I had thought of, but still considering the given circumstances I managed to give my best to it. The only problem I felt was I was unable to comment on any of the blogs that I wanted to. I so wished to return the blog hop by commenting on theirs and showering some love but I could not manage to do that. Better late than never I will once again try to connect with all of them and leave some love no coz they showered on me, but because sometimes in life we all could do with a little bit of love. The online group which we formed solely for this purpose was so helpful in terms of encouragement and they sometimes became the much needed push for me to keep going till the last alphabet. And yes I am still looking forward to the next A to Z blog hop and will try to ensure all that I could not this time. Congratulations on completing the challenge. Keep blogging! Congratulations! I hope things are getting better on your side and that you have many more brighter days ahead! P.S: Can you please mail me your mobile number? Thanks so much dear... I did mail you! Great job on surviving the challenge! :D I've added a link to your post in my reflections post! Thanks so much Vidya, touched! I'm sorry it was such a hard month for you. Never quit is a good motto! Thanks Tina.. trying to get things back on track.. appreciate your being here today!